Written in 1975, THE MONKEY WRENCH GANG follows the fictional exploits of four self-appointed eco-saboteurs as they work, tirelessly, to dismantle and retard the encroachment of industry and development into the Four Corners region of the American Southwest. The four members of the gang; an Albuquerque doctor, his artistic New Left nurse/girlfriend, a Jack Mormon river guide, and a Vietnam vet; develop a strategy of sabotage to protect the natural environment of the American Southwest during a rafting trip through the Grand Canyon. While Glen Canyon Dam remains simultaneously the epitome of industrialism and the ultimate target of their plans, the gang hones their skills on targets of increasing significance and risk. By uprooting surveying stakes, destroying bulldozers, and derailing coal trains, the gang attracts unwanted attention from Bishop Love, a local developer and head of the San Juan County Search and Rescue Team. As the novel progresses, the gang goes after bigger targets, comes increasingly closer to getting caught, and must run further and faster to evade capture. While a prologue foreshadows the survival of the movement, despite the ongoing success of industrialization and development, the story culminates in an extended chase through the desert canyons of Southern Utah, which is described by the author in a detail that captures the beauty, openness, and harshness of that environment in such a manner that the reader cannot help but be drawn in to believing that the end of this pursuit will determine the survival of the gang’s ideals. (Excerpted from Darren Botello-Samson’s review of Edward Abbey’s novel The Monkey Wrench Gang). Afghanistan – how much longer? Glenn Greenwald explains: As soon as we’ve killed every Afghan who wants us to leave, then we can leave. But not before. The teenage insurgents spend their days learning to make shoes and bookshelves, listening to religious leaders denounce the radical interpretation of Islam they learned as children. But when they return to their cells at Kabul's juvenile rehabilitation center, the boys with wispy beards and cracking voices talk only of the holy war from which they were plucked and their plans to resume fighting for the Taliban. As the Taliban presses its efforts to recruit teenage fighters, Afghan officials and their international backers have crafted a program to reintegrate the country's youngest insurgents into mainstream society. But that ambition is coming up against the intransigence of the teens, who say they would rather be on the battlefield. "We'll fight against America for a thousand years if we have to," said Ali Ahmad, 17, sitting at a desk that has hearts and Koran verses scratched in the wood . . .
"They bring us here to change us," said Nane Asha, in his late teens. "But this is our way. We cannot be changed." . . . The Taliban visited Asha’s school when he was about 13, preaching the evils of American interlopers and the value of violent jihad. Asha approached the speaker after the sermon ended. "How can I join you?" he asked. . . . Within a few weeks, Asha was enrolled in a six-month training course, learning how to fire a Kalashnikov and to connect a nest of wires and explosives that could take out a U.S. tank. He studied the material obsessively. . . .
Reintegration is at the heart of U.S. and Afghan government strategies to wind down the war, with schooling and employment being offered to coax fighters away from the insurgency. To summarize: our invasion and occupation is what enables the Taliban to recruit massive numbers of Afghan teenagers into their cause. And now, we have to stay until we either kill all the people who hate us and want us gone from their country or propagandize deradicalize them into meekly accepting our presence. Once there are no more Afghans left who want us gone, then we can leave. For those of you who have been cynically claiming that this war has no discernible purpose other than the generalized benefits of Endless War for political officials and the Security State industry, now you know. Sarah Palin appealing to liberals? I am damned. Yes, Sarah Palin is now featured on Nothing Is Final. Clearly nothing is sacred. Get a load of this New York Times article about La Palin. I’ve underlined and italicized the unexpected and telling paragraphs. More hippy-dippy Paul Krugman nonsense. Pay no attention. In the first half of last year a strange delusion swept much of the policy elite on both sides of the Atlantic — the belief that cutting spending in the face of high unemployment would actually create jobs. I went after this stuff early and hard (I suspect that the confidence fairy will be one of my lasting contributions to economic discourse); still, it’s good to have a steadily mounting weight of evidence about just how wrong that view was. The reduction in incomes from fiscal consolidations is even larger if central banks do not or cannot blunt some of the pain through a monetary policy stimulus. The fall in interest rates associated with monetary stimulus supports investment and consumption, and the concomitant depreciation of the currency boosts net exports. Ireland in 1987 and Finland and Italy in 1992 are examples of countries that undertook fiscal consolidations, but where large depreciations of the currency helped provide a boost to net exports. Unfortunately, these pain relievers are not easy to come by in today’s environment. In many economies, central banks can provide only a limited monetary stimulus because policy interest rates are already near zero (see “Unconventional Behavior” in this issue of F&D). Moreover, if many countries carry out fiscal austerity at the same time, the reduction in incomes in each country is likely to be greater, since not all countries can reduce the value of their currency and increase net exports at the same time. Simulations of the IMF’s large-scale models suggest that the reduction in incomes may be more than twice as large as that shown in Chart 2 when central banks cannot cut interest rates and when many countries are carrying out consolidations at the same time. 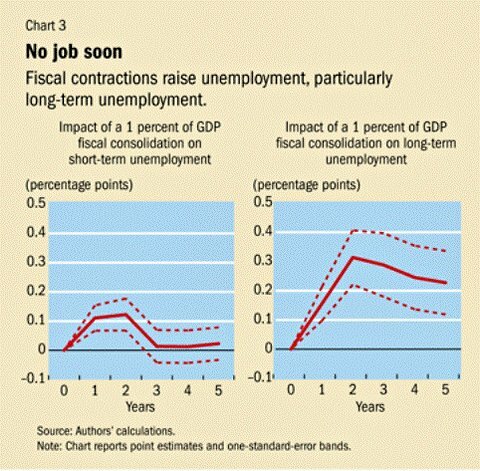 These simulations thus suggest that fiscal consolidation is now likely to be more contractionary (that is, to reduce short-run income more) than was the case in past episodes. Unfortunately, austerity programs are now the rule everywhere; even if the new Obama plan became law, which it won’t, it would only slow the pace of fiscal consolidation in America, and there’s nothing like it even on the table elsewhere. Pay no attention! Paul Krugman is just another hippy-dippy, left-wing kook. Just another elitist snob who happens to be a Nobel laureate. So, keep on ignoring him! Never forget that the atmosphere of oppression, suspicion, paranoia and racism which has taken root in this country since September 11, 2001 has been fostered and maintained by both Republican and Democratic governments. My wife and I attended the Friends of Atascadero Library benefit last night at the Brickyard Theatre in Atascadero and ran into a woman we’ve known for many years. She and her husband are the kind of indispensible folks who help keep cities and counties on track – community volunteers, school board and planning commission members. That sort. She told us she and her family are departing the USA and immigrating to Canada. Having just returned from a three month tour of our northern neighbor, I can understand their impulse – Canada’s much like the USA once was and may never be again. I've been living in Germany for a few years now, and every year the idea of ever returning to the US grows more and more distasteful. The (metaphorical) air in the US grows ever more caustic, the desperation more palpable, the citizenry increasingly turns on itself. I'm young, highly educated, and can live anywhere - I found Berlin to be an easy place to adjust to, and while Germany certainly has its serious problems, it is nevertheless free of America's caustic, suffocating atmosphere. Last month, some friends from the US came to visit me. To a man, they all said the same thing, that I was right to have left the country, and that they're very seriously thinking of doing the same. I don't think it was idle chatter. As the US feels more and more like a failing state, I think this phenomenon - an exodus of the most educated and employable - will rise and become difficult to ignore. Unlike Paul, I’m curious to read your comments.